it's almost been a full week since sammy turned 8 months old, and i've finally gotten around to taking his photo. he may not look all that different in pictures, but he's definitely growing (and the box of clothes that he's grown out of is also growing). 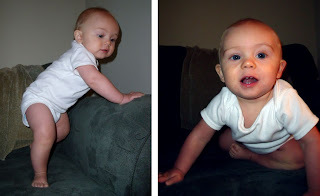 he's been trying lots of new foods and putting his teeth to good use, and is now getting around quite easily by crawling. he likes to stand whenever he gets the chance, and is on the move before i can get a clean diaper or a pair of socks on him. he's definitely keeping me on my toes. as much as i hate to leave behind his little baby phase, i'm definitely enjoying "big kid sammy" and all that he can do, and games he can play, and things that he laughs about, and i'm looking forward to what's next on this boy's agenda.